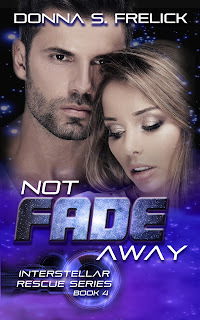 Today, our Monday Meet the Author guest is Donna S. Frelick, who has been a member of the SFR Brigade from day one, and who has an exciting new Science Fiction Romance release coming on June 12th! Welcome, Donna! How or why did you first start writing SFR? Any particular inspirations? What are your favorite SF/R movies or television series and why? This is a long answer because I have to combine two questions. I started out my SFR career writing STAR TREK fan fiction, and I’m still a huge fan of The Original Series. Yes, I can quote scenes and episodes, name characters and shout “Ka-a-a-h-n!” at the skies with the best of them. There was always plenty of love in TOS, but not enough romance. Kirk was forever leaving his women behind because of death or duty. So I felt compelled to write better endings for him in the fan fiction work I published in the nonprofit underground Orion Press, sold online and at SF cons. Good practice for my own novels later, though my Interstellar Rescue series is really more X-FILES (love that one, too!) than TREK. How many SFR books have you published and what are the titles? Can you give us a quick blurb on your most recent or upcoming title? I’m the author of the contemporary SFR Interstellar Rescue series: Unchained Memory (Book 1); Trouble in Mind (Book 2); Fools Rush In (Book 3); and Not Fade Away (Book 4—launching June 12). They are stand-alone novels, each with a different romantic couple, but all set in the same universe. The IR universe is a little different in that it’s largely set here and now. Much of the action, particularly in Unchained Memory and Trouble in Mind, takes place on Earth. That’s why I call it contemporary SFR. But Rescue’s Earth is a kind of “rural backwater” in a very busy galaxy full of slave-trading bad-guy aliens, abolitionist good-guy heroes, and plenty of colorful characters. Until her love unlocked his heart. Rescue agent Rafe Gordon is human, though Earth has never been his home. But when his legendary father Del becomes the target of alien assassins, Rafe must hide the dementia-debilitated hero in the small mountain town where the old man was born—Masey, North Carolina, USA, Earth. Home care nurse Charlie McIntyre and her therapy dog, Happy, have never had such challenging clients before. Del’s otherworldly “episodes” are not explained by his diagnosis, making Charlie question everything about her mysterious charge and his dangerously attractive son. Rafe has the answers she needs, but Charlie will have to break through his wall of secrets to get them. As the heat rises between Charlie and Rafe, the deadly alien hunters circle closer. The light they seek to extinguish flickers in the gloom of Del’s fading mind—the memory of a planet-killer that threatens to enslave the galaxy. Rafe was silent a moment, then he lifted his hand to touch her face. "I know it’s selfish of me, Charlie, but I’m not a bit sorry we met. I’m just sorry that means you got caught up in . . . all this." She shook her head. "All this is your life. It's a package deal." "Midnight murders, slave-trading aliens and all?" he countered. chance and laid her heart open. “I don’t know. Could be that means I love you, Rafe. What do you think?” She held her breath and waited for him to find a way out of the bind she’d put him in. 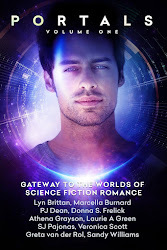 The first two books in the Interstellar Rescue series—Unchained Memory (Book 1) and Trouble in Mind (Book 2)—were finalists in the 2012 Romance Writers of America® Golden Heart® contest for unpublished manuscripts. Fools Rush In, Interstellar Rescue Book 3, was a 2016 SFR Galaxy Award Winner. I’m very proud of all my book babies! How long have you been a member of the SFR Brigade and do you serve any special roles within the community? I’m proud to say I have been a Brigade member since the organization was just a gleam in Laurie Green’s sparkly eye! I am one of the Brigade’s signature members, but my only special role has been to be a sounding board for Laurie’s fantastic ideas! I think it’s wonderful and amazing how the Brigade has grown over the years to encompass so many authors, styles, interpretations of SFR and visions of the future. When writing, which usually comes first for you—the romance or the other elements of the story? I’m a big believer in HEA and the idea that love conquers all, so, yeah, the romance comes first for me. That doesn’t mean I don’t enjoy playing with SF ideas, in particular, alien cultures and political structure, the scary idea of alien abduction and the hopeful counter of an intergalactic abolitionist movement. I love action, too, and suspense—enough to keep the plot moving. But the focus is always on the relationship at the center of the story. Not Fade Away, Interstellar Rescue Book 4, available NOW on pre-order! Donna S. Frelick has been a journalist, a Peace Corps Volunteer and an author of STAR TREK fan fiction. She was an RWA® Golden Heart® Double Finalist in 2012 for the first two novels in her contemporary SFR Interstellar Rescue series and an SFR Galaxy Award winner for the third book in the series. She lives on 44 beautiful mountain acres near Asheville NC with her husband and two talkative cats. Thanks for having me today, Laurie! It was lots of fun answering those questions! Happy to host you, Donna. Not Fade Away looks awesome!